Thank you for visiting Custom Garage Works! Known for our custom garage floor coating in Royse City, TX, we originally started our business in 2003. After looking high and low in the existing industry, we were shocked to find very few options that were up to a top quality standard, so we jumped into the industry ourselves, to turn things around. Presently speaking, we are able to provide our clients with some of the best garage storage solutions on the market, along with floor coatings that are tougher and longer-lasting than traditional epoxy. Our contractors are professional trained, and we are passionate about designing custom garages, with impressive garage floor coating results across DFW. Out of all of our services, our most common services is the polyurea polyaspartic floor coating in Royse City, TX. This is because by using polyaspartic coatings instead of epoxy, we create a finish that lasts longer and performs better. Unlike epoxy that can yellow in the sun, and peel or flake over time, these coatings are stronger and more resilient. Since we only use a diamond grinder to prepare the concrete for coating, as opposed to acid etching, we can ensure a higher quality end result. If you’d like to learn more about our professional garage floor coating services, give us a ring at 214-494-9068 or 817-308-1305 and ask for your free estimate! Garage Floor Grinding Our diamond grinding techniques will help you get the optimal surface to apply your floor coating to. Epoxy Coatings Epoxy coatings are relatively inexpensive, and have a cure time of 5 to 7 days. Polyurea Polyaspartic Coatings These coatings are particularly durable, as well as resistant to high temperatures and UV rays. When you decide on a storage solution from Custom Garage Works, you never have to wade through mountains of clutter in your garage again. 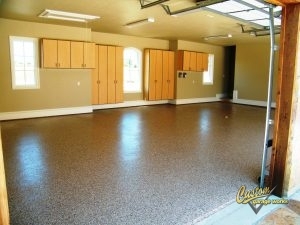 We realize that a brand new garage floor looks greatest when it won’t be covered by other items in your garage. We offer a variety of solutions to organize your belongings, including overhead storage racks as well as garage cabinets. Designed specifically for garage use, our garage cabinets are among the greatest in the business, and our storage racks are designed for high capacity storage. If you need a reliable garage floor coating in Royse City, TX, and unbeatable organization solutions, you can count on Custom Garage Works. Overhead Storage Racks If you want to get more out of your overhead storage space, our durable storage racks are a great place to start! 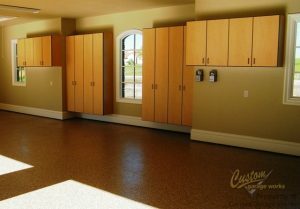 Storage Cabinets Our custom garage cabinets are specifically designed to be stronger, and to resist extreme temperatures. Car Lifts Our car lifts let you keep your cars with style and accessibility, and they won’t scar your garage floors! And More! Don’t be worried by clutter in your garage any more. We have the organization products you need!